Crafting for Chinese New Year is a lot of fun, because you can use bright colours, glitter and streamers, and there is lots of inspiration out there. 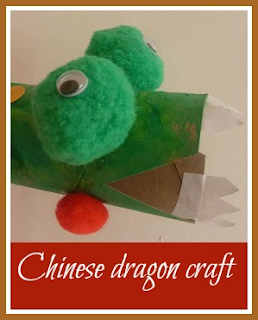 I find that my Chinese New Year crafting tends to be influenced by dragons, and so we made some simple dragon puppets from empty toilet roll tubes. This has been the first year that I've managed to do some Chinese New Year crafting, as it's a festival that always creeps up on me after Christmas. But this year I took up a challenge set by Red Ted Art to share a Chinese New Year craft. I do like my toilet roll tubes, and so I decided to make some simple Chinese dragon puppets made from toilet roll tubes. First paint the toilet roll tubes in a dragon colour, we used green. Glue a googly eye to each pom pom. When both parts are dry, cut a triangle from each side of one end of the toilet roll tube to create a mouth. Glue the pom poms onto the head of the dragon. You will need plenty of glue to make them stick firmly. Leave it to dry. Then use collage materials to decorate the dragon. We used scraps of green paper and some small circles cut from gold card for gold scales. Cut some teeth from thin white card and glue inside the mouth. Cut some long strips of tissue paper for the tail, and staple them firmly inside the back of the dragon at the top. Finally fix a lollipop stick at the bottom of the dragon's back. I used double sided sellotape with more sellotape to cover on top, as it needs to be stuck firmly so that the dragon can be played with. Then the children can fly their dragon about using the lollipop stick to hold on to. Because this is our first Chinese New Year craft, we weren't familiar with the story behind Chinese New Year. I found a fantastic printable introduction over on the Twinkl website - The Chinese New Year Story (Twinkl subscriber resource). I printed it out to make a little book, in black and white so that it could be coloured in. The last page of the story book also makes a nice Chinese Zodiac colouring poster, which is marked with recent calendar years so you can use it work out the animal for the year that the children were born in. I printed out a Chinese New Year word map (free download) to help Harry extend his reading vocabulary. Many of the words, such as the names of the animals, are ones that he uses regularly anyway. I also printed him a colour by numbers dragon (free download), as he loves colouring, and the sense of achievement that comes from working out which colours to use. These look amazing, a great Chinese New Year craft idea. I wonder if you could add an old sock or fabric to the end to make it into more of a hand puppet, thinking it might be easier for smaller hands. Thank you! That's a great idea to add something to the end. My son has already stuck some card over the open end of his so that he can get the dragon to 'eat' things! That is a FABULOUS dragon. How cool did he turn out?! Love the pom pom eyes. Perfect! Those are very cute, and I might just have to give them a try! Those are AMAZING! Am pinning. 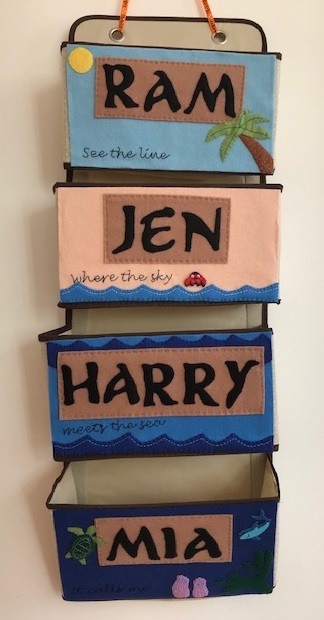 I do love toilet roll crafts. Those dragons are amazing! Happy New Year! These are adorable! I love the pompom eyes. Aw, these are so cute! I love Chinese New Year, I'm off to pin these now! The pompoms are a great idea for eyes - he looks so fantastic - love how you used the lollipop sticks to make it a puppet too.